On Friday February 3rd 2017, Take The Lead celebrated its third retreat of the year at Rowe Clark Math and Science Academy. 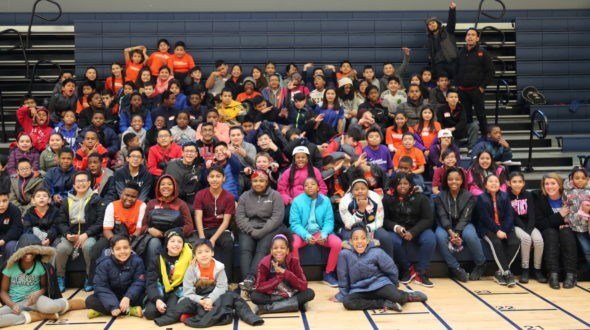 There were 115 team captains who attended, representing 35 schools throughout Chicago. The themes for this retreat were goal setting and self-esteem, two topics that help Team Captains prepare to finish out the rest of the school year. This high-energy event was kicked off with motivational and inspirational remarks from Rowe-Clark’s Principal Ms. Cora and Haitian Olympic Swimmer Naomi Grand-Pierre. After, the students went on a scavenger hunt inside of Rowe-Clark. The students were able to learn more about high school and the many classes and extracurricular activities that are offered. At each scavenger hunt location, captains participated in activities that help them understand the importance of time management and teamwork when setting goals. This retreat was directly related to the high school readiness component. The students also had a chance to let loose and play some soccer and other activities in the gym. The soccer tournament was a great opportunity for the captains and coaches to meet other Team Captains throughout the city. One of the best parts of this retreat was the trivia game show students played and the presentation of a few service learning projects. This gave Team Captains a chance to showcase the knowledge they’ve gained over the years and how they are taking action in their communities. This game show wasn’t just all questions. The most memorable moment was when they chose the “Music” topic and had to demonstrate a dance as part of the answer. Watching 10 different groups of captains all dance to “Ju-Ju on the Beat” was the best thing we’ve seen at any retreat this year. Each Team Captain had their own dancing style and all motivated and hyped each other up. This activity was a great example of self-esteem, and a great opportunity for captains to help build their own self-esteem. It was also helpful in understanding how to set goals. A few of the questions went over the MAD goal-setting format, which was a great way to help the students learn how to set realistic goals. During this retreat, captains also had a chance to share and present the service learning projects they have been working on throughout the fall season. A few topics they covered was access to sports and healthy foods, access to education, trash and environment, and violence. The balance of physical activity and educational content during this retreat was amazing. It was clear that both Team Captains and volunteers enjoyed every aspect of the experience. Urban Initiatives would like to thank Rowe Clark Math and Science Academy for hosting the retreat and Aramark for providing the nutritious and delicious boxed lunches that gave Team Captains the fuel they needed to be active participants.